The election charade of 2012 is finally over. Nothing changed. President Obama is reelected, the House is controlled by the Republicans and the Senate by Democrats. We would have been better off had we voted for Pedro. The day after the elections, the same old shameless spin began all over. On the Republican side, the propaganda machine has "reset the war", blaming their loss on "minority welfare queens". On the Democratic side, the so called liberals talk the talk of liberalism yet they are just as reprehensible. It was Bill Clinton who repealed Glass-Steagall Act, paving the way for all sorts of deregulation which eventually lead to the 2008 Financial Crisis and the subsequent bank bailout. Where were the liberal voices when Presidential candidates failed even to mention global warming in their campaigns. The news are a charade, pundits are a charade, politicians are a charade. Only the Occupy Movement got it right so far. The powers that be are back to blaming the victims. 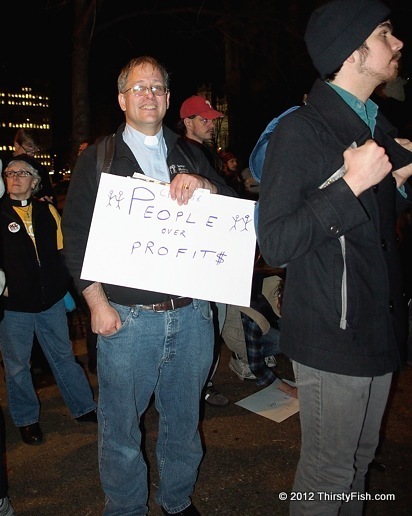 When the pictured clergyman holds his sign,"People Over Profit" up, he is not asking for handouts for the poor. Most poor are simply looking for opportunity, a fair system. Corporations have rigged everything, and they will not stop until either everyone dies of poverty or they are stopped. Think about it, almost 50 percent of Americans get some sort of government assistance. It is preposterous and insulting to argue that over a 150 million Americans just want to be "welfare queens". Wake up America!